by Quin at NRO’s The Corner. [F]ormer AmeriCorps Inspector General Gerald Walpin, the first direct employment victim of the Obama administration’s war against propriety, was struck and killed by a vehicle [June 24] while crossing a Manhattan Street. Jerry was a fine public servant, a deeply principled conservative, and a wonderful human being. This is an awful tragedy, and a terrible loss. When the Obama administration engineered — illegally, although the bad guys got away with it — the firing of Walpin from his job as watchdog of the Corporation for National and Community Service, we editorialists at the Washington Times (my job at the time) were appalled…. We began a long series of editorials and columns (more than a dozen) breaking new stories reporting ever-more outlandish aspects of the case. … We were right about the Obama administration’s war against Inspectors General. At one point, 47 of the 73 federal IGs wrote an open letter blasting the Obamites for stonewalling investigations. 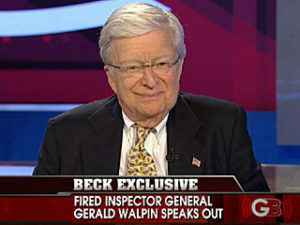 But Walpin was more than just a victim of the Obamites, more than a canary in a very fetid coal mine. …. Please do read the rest of my memorial to Jerry, who over the past half-decade had become a friend of mine. America is fortunate to have good men like him.